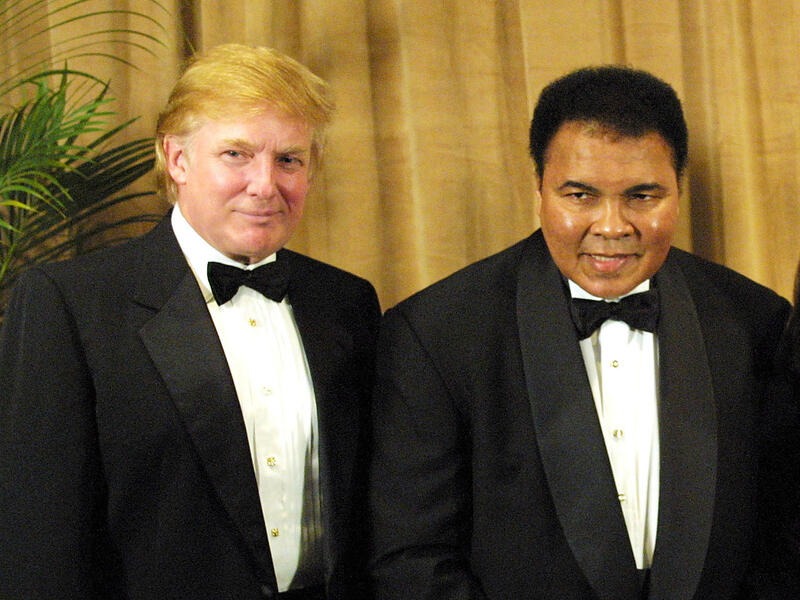 In this file photo, Muhammad Ali is honored on March 14, 2001, receiving the UCP's Humanitarian Award from Donald Trump at the United Cerebral Palsy dinner at the New York Marriott Marquis Hotel in New York City. Certain rituals have grown up around the use of the presidential pardon. The most common is a lengthy review by the Justice Department on the merits of any such petition for a pardon. But for President Trump, the pardon seems to have become the ultimate symbol of presidential power — the ability to use this exclusive authority as an act of benevolent largess and as the ultimate political perk. In recent decades the power to pardon has been used to varying degrees, but one thing fairly consistent is that pardons traditionally went through a careful process. Before the president would sign off on the ultimate act of legal forgiveness, the Justice Department would review each case and then make a recommendation on its worthiness. Let's go back 60 years and the past 10 presidents. Lyndon Johnson comes in at the top with 960 pardons. Barack Obama pardoned just 212. President Trump's tally in less than 18 months is so far small. Just five total. But it stands out nonetheless. While other presidents have occasionally issued controversial pardons — think Bill Clinton's gift to millionaire financier Marc Rich on his final day in office in 2001 — most are somewhat mundane and follow the process of formal petition to the White House and a formal investigation on the merits. Even though the number of Trump pardons is small, he is openly enamored of the tool. And a trend has already appeared — Trump's pardons have leaned toward persons of some notoriety. Think Sheriff Joe Arpaio or Lewis "Scooter" Libby. Or they've been famous — the late boxer Jack Johnson. Each came quickly, seemingly through direct engagement of the president himself. And often there's a clear message to Trump's political base. Today President Trump is signaling that the pace will pick up. "There will be more pardons," he told reporters on the South Lawn of the White House as he departed the U.S. for summits in Canada and in Singapore where he'll meet with North Korean leader Kim Jong Un. Just how many more could be coming? Well, the president said he's got a long list of requests they are looking at. "We have 3,000 names," he said today, adding, "many of those names have been treated unfairly." Asked if there'll be one for OJ Simpson, the president replied that he's "not thinking about OJ" but quickly added that he was considering another famous athlete, "I'm thinking about Muhammad Ali." Ali went to prison and was forced to put his boxing career on hold for his refusal to submit to the military draft during the Vietnam war. In 1971, the U.S. Supreme Court did unanimously reverse Ali's conviction. Ali's attorney, Ron Tweel, reacted to Trump's comments on Friday saying that the high court's ruling makes a pardon wholly unnecessary. "There is no conviction from which a pardon is needed," the attorney said in a statement. There is no small irony here. Ali's legend grew out of that anti-war protest and the sacrifice that came with it. He was opposed to the actions of the U.S. government. He was opposing the war. Now Trump is offering a pardon to the late boxing icon even as the president regularly questions the patriotism of modern day athletes who kneel during the national anthem at sporting events to protest and bring awareness to the treatment of black Americans in this country — including police brutality. Trump has gone so far as to say that those who refuse to stand for the anthem shouldn't be allowed in this country. Alluding to those who protest, Trump said Friday that if those athletes have complaints then a better process would be to reach out to him personally. "I'm going to ask them to recommend to me people who are unfairly treated," he said. It's a statement that implies that he can fix such concerns, even as he pursues policies that his critics say make achieving equality and justice for many Americans less likely. There's another example of this dynamic at work. The Trump pardon this week — at the request of TV reality show star Kim Kardashian — of Alice Marie Johnson, a 63 year old woman serving a life sentence since 1996 for distributing cocaine and money laundering. The White House portrayed it as an act of compassion, issuing a statement that read, "While this administration will always be very tough on crime, it believes that those who have paid their debt to society and worked hard to better themselves while in prison deserve a second chance." "The power to pardon is a beautiful thing," adding, "I want to do people who are unfairly treated like an Alice." He didn't elaborate on how, specifically, she was treated unfairly. At the same time, however, the President and his Justice department are taking action that would put other non-violent drug offenders in a position similar to Johnson's, where they face long, mandatory prison sentences for drug related offenses. The Obama justice department had begun to implement changes in sentencing guidelines resulting in such lengthy incarceration for non-violent offenders. The Trump administration has reversed those changes. That puts the Presidential pardon at odds with the presidential policies.